Asthma is a common disease that occurs in the airways of the lungs known as the bronchial tubes. Normally when a person breathes in and out, the muscles surrounding these airways are relaxed, allowing air to move freely. However, when a person has asthma, allergens, environmental triggers, or infections can cause these muscles to tighten up, making it more difficult for air to move freely in and out of the airways and causing shortness of breath and a whistling or wheezing sound. This tightening, which is linked to persistent inflammation in the airways, is called “bronchospasm.” In some cases, the airways can become swollen or filled with mucus as well, making breathing even more difficult. About 12 to 15 million Americans are affected by asthma. Many people first have signs of the disease in childhood, but it is important to note asthma can occur for the first time at any age. Particularly vulnerable are those with a family history of asthma or those with a history of allergies or exposure to tobacco smoke. Some people also have a form of the disease known as exercise-induced asthma, which is triggered by strenuous physical activity. Asthma is a disease with many different symptoms that occur in many different ways and combinations. 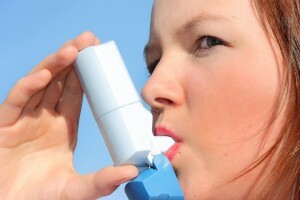 Some people with asthma only have symptoms periodically and they are generally mild. Others have symptoms more often and may experience symptoms that are more severe. Others still have symptoms every day or symptoms that are so severe they are life threatening. The good news is, most people with asthma will begin to have these and other symptoms early enough to seek appropriate treatment and stop a severe attack from occurring. When early symptoms occur, follow your doctor’s instructions for changing and/or increasing your medications. If your doctor has prescribed the proper medications, this will usually stop an attack from occurring or getting worse. While there is no cure for asthma, there are many proven treatments for the disease. The key is taking these medications exactly as your doctor recommends. Pulmonary & Sleep Specialists, PC, in Atlanta, Georgia, is a provider of specialized care in the areas of Pulmonary Medicine, Sleep Medicine, Critical Care Medicine, Snoring, Sleep Apnea, Sleep Apnea treatment, CPAP Therapy, CPAP Treatment, CPAP Intolerance, Lung Disease, Sleep Disease, Allergy, Breathing Disorders, Asthma, Emphysema, COPD. Serving Atlanta and surrounding areas for over 12 years.